Maker, Warren Telechron, Inc., Ashland, Massachusetts, USA. Model Type A, serial no. 454, c. mid 1920's. One second Invar pendulum whose rate could be electro-magnetically controlled. Red oak case. Originally set up at the Nut Island, Virginia. sewerage treatment facility. 58"h x 16"w x 12"d. The word Telechron is a composite pair of words from the ancient Greek: Tele = to or at a distance, and the Latinized Greek word Chronos, chron = time. Time over distance. The perfect description of a master clock. Click on the picture to go to a page for more detail. Henry Warren was a prolific electrical inventor with many patents to his name, most important was that of the self-starting synchronous motor in 1916. He wanted to use this new motor to power clocks and formed a company to make domestic clocks using his motor to replace the mechanically wound clocks of the day. The accuracy of the motor and therefore the clock depended on the frequency of the alternating current upon which it ran. At that time power station operators were not as concerned as today with frequency control since electricity was used primarily for lighting and motors. Warren developed the Type A to encourage power plant operators through an easy to use device, to better control their frequency. They did this not to help out Warren and his fledging clock company, but because of the fact that the nascent electronics industry, notably radio needed this and was becoming widespread. In the 1930's the need for US electrical grids to shift power between them also arose (known as 'wheeling power'). Tight frequency control is essential for this to be done safely. The rise of Warren's electric master and domestic clocks were the demise of other systems, notably the Hahl pneumatic system. 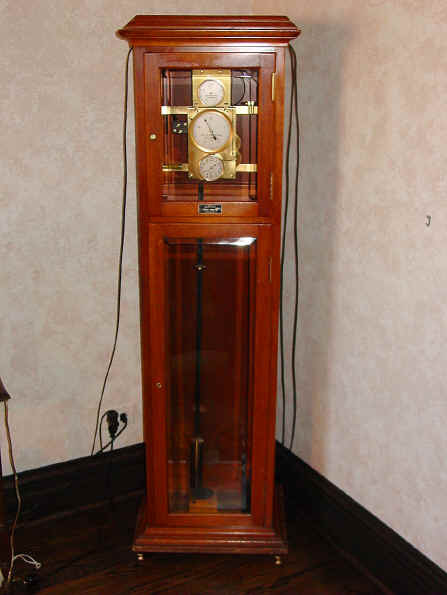 This model of master clock was the first type introduced by the Warren company in 1916 and was produced through the 1920's by which time well over 400 had been manufactured and sold for $400.00, ($8390.00 in 2010 Dollars). It remained little changed and remained in use in power stations until the late 1940's when it regulated over 95% of all the electric lines in the US. (1) It began to be replaced by the cheaper, alternative systems; the first being the the carefully regulated tuning fork in 1936, followed by the quartz oscillator in the 1950's and finally the atomic regulator following on in the 1970's. The smaller, less expensive wall mounted Type B was introduced in 1920 and sold for $150.00, ($3145.00). It was used in smaller installations that were not interconnected via the electrical grid and so did not require the same accuracy as featured in the Type A. Another specialized master clock introduced in 1921 which was mounted in an identical case to the Type A was their Type C, but it operated in a totally different manner and was designed for use in the very few DC power systems still operating at the time. The last model the company introduced in 1929 was the Type E; a clock that never saw full production. It is a precision mechanical clock that is kept wound electrically. It's function was to act as a reference to monitor the accuracy of the a/c line frequency in multiple-connected electrical grids. This clock has an ingenious self-correcting electro-mechanical feedback system accurate to 1/400th second and operated in a partially evacuated (vacuum) environment. Apparently a Type D existed but was never put into production, and appeared to be only a "test bed" used internally by the Telechron company. Following is a discussion of the Type A. The bottom dial is a regular clock driven by the mechanical master clock movement. The center dial has two superimposed hands. One a black hand driven by the mechanical movement and the second, a gold hand driven by a synchronous motor. The dial is divided into five one minute sectors. Both hands move at the speed that a second hand would. The upper dial is driven by a second synchronous motor whose hand also moves by the second; its' dial is the same as the center. This was used as a backup in case the main synchronous motor should fail or need service. This clock was very easy to use. All the operator needed to see was that both the black and gold hands on the main dial were super-imposed upon each other to know that the line frequency was correct. Any deviation left or right could be read directly off the dial and would let the technicians know by how much fast or slow the generators had to be adjusted to keep the line alternating current (AC) at 60 cycles/second. This works because a synchronous motor will turn at the speed (frequency) of the alternating current that is powering it. Hence the name synchronous. Through reduction gearing the motor which turns 60 times a second is made to turn the gold hand at the speed of once per minute. An interesting reversal of roles is now in effect. The modern generating plants of today keep their current frequencies quite accurate using electronics that are far better than a mechanical clock. So today the gold hand connected to the synchronous motor is used to monitor the accuracy of the mechanical master clock rather than the other way around as was the original intent! The movement is quite accurate down to less than a few seconds per week. 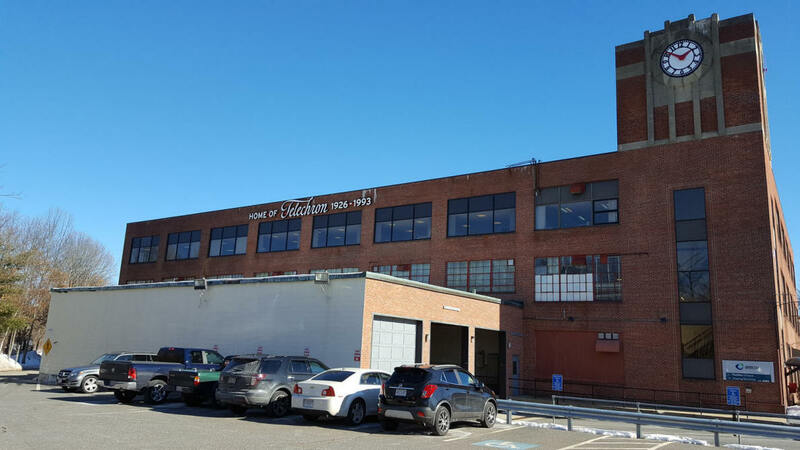 The old Telechron factory building. 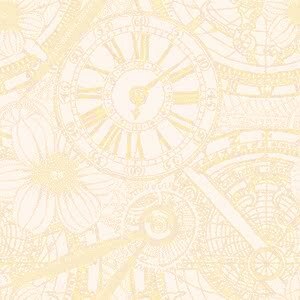 The word Telechron is a composite pair of words from the ancient Greek: Tele = to or at a distance, and the Latinized Greek word Chronos, chron = time. Time over distance. The perfect description of a master clock.